The Guardian publish on december, 13th, an interesting article from Sarah Smith.What inspire volunteer life-savers? John Stepney, 56, lives in Drayton Parslow, Buckinghamshire, with his wife and two teenage daughters. 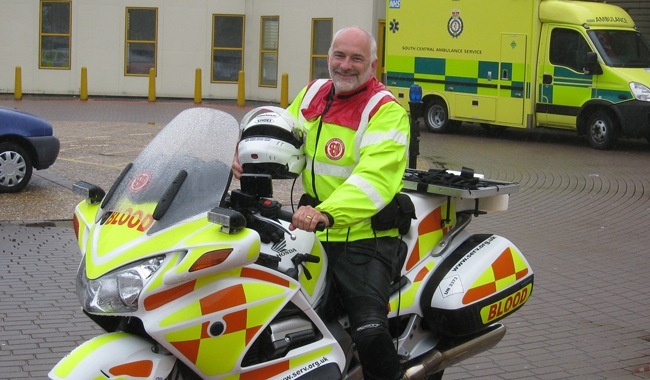 He is an IT consultant and UK chairman of the Nationwide Association of Blood Bikes, with whom he has volunteered for eight years. Snaking through traffic-jammed Leicester Square, avoiding rickshaws, stretch limos and drunk clubbers at 1am, or ducking as a large barn owl swoops across my path on a dark, deserted Oxfordshire country lane, I’m always so aware of what I’m transferring on my motorbike. It could be spinal fluid extracted from the base of a child’s skull, to be urgently checked by a laboratory for meningitis. There is only so much of that in the body – you can’t just go back and get some more if you drop it. This is a very serious business but as most of our work is done in the early hours, many people don’t know we exist. On standby a couple of nights a week, I carry anything a hospital needs outside regular working hours for the clinical treatment of a human being, from rabies serum to x-rays, and of course blood. I’m used as part of a massive bleed protocol, which means there is someone in surgery and they are unexpectedly losing more blood than current stocks can maintain. Legislation states that we are allowed blue lights, but we can’t break the speed limit or go through red lights. On an emergency run, it can be frustrating to sit at traffic lights at 2am, but we can’t adopt a cavalier attitude. If I’m carrying factor VIII clotting agent from the regional haemophilia centre to a local hospital’s paediatric ward, a child’s life is dependent on my safe arrival. For my most challenging run I had to resort to my Land Rover Discovery, as at 9pm on a winter’s evening the ground was covered with six inches of snow and the M40 was blocked by abandoned cars. A Slough hospital was down to its last two units of red blood cells and needed some delivered from Oxford. It also needed platelets for a patient on the operating table. I was then called to collect a blood sample from a collapsed patient in A&E, which needed to be tested at Stoke Mandeville in Aylesbury. The whole run took six hours. Covering the counties of Northamptonshire, Oxfordshire, Buckinghamshire and Berkshire, 150-mile round trips are expected. Blood bikers don’t claim anything – all the costs, such as fuel, come out of our own pockets. When I catch a glimpse of a premature baby in an intensive care incubator as I deliver donated human milk, or I’m in front of the bed of a sick cardiac patient whose heart output trace I’m collecting, it makes it very real. Volunteering can be tiring but it’s hugely rewarding and humbling – I’m amazed by the focus and dedication of the other people in the team, who all have full-time jobs, too. My kids do think it is a bit odd that I don’t stay in and watch telly like other dads, but there’s nothing much on these days anyway.